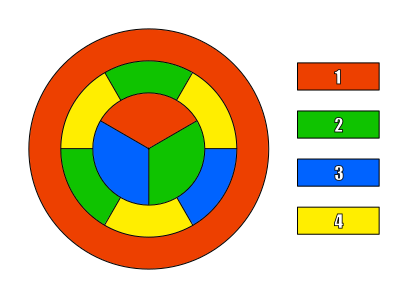 My brother in law and I were discussing the four color theorem; neither of us are huge math geeks, but we both like a challenge, and tonight we were discussing the four color theorem and if there were a way to disprove it. After some time scribbling on the back of an envelope and about an hour of trial-and-error attempts in Sumopaint, I can't seem to come up with a pattern that only uses four colors for this "map". Can anyone find a way (algorithmically or via trial and error) to color it so it fits the four color theorem? A few people have commented that all of the answers given so far have been identical up to symmetry (either by exchanging colors, or by using a symmetry of the uncolored diagram). Here's a proof that the answer that everyone has given is the only possible answer, up to symmetry. Without loss of generality, assume that region 1 is red, region 2 is green, and region 3 is blue. Is region 10 yellow? I will prove that it is not. Suppose that region 10 is yellow. Then since region 5 borders regions 1 (red), 2 (green), and 10 (yellow), region 5 must be blue. Next, since region 6 borders regions 2 (green), 5 (blue), and 10 (yellow), region 6 must be red. Now region 7 borders regions 2 (green), 3 (blue), 6 (red), and 10 (yellow), so it cannot be colored. This proves that region 10 is not yellow. We now know that region 10 must be red, green, or blue. Without loss of generality, assume that region 10 is red. Region 7 borders regions 2 (green), 3 (blue), and 10 (red). Therefore, region 7 is yellow. Region 6 borders regions 2 (green), 7 (yellow), and 10 (red). Therefore, region 6 is blue. Region 5 borders regions 1 (red), 2 (green), 6 (blue), and 10 (red). Therefore, region 5 is yellow. Region 8 borders regions 3 (blue), 7 (yellow), and 10 (red). Therefore, region 8 is green. Region 9 borders regions 1 (red), 3 (blue), 8 (green), and 10 (red). Therefore, region 9 is yellow. At this point, the only uncolored region is region 4. Its neighbors are regions 1 (red), 5 (yellow), 9 (yellow), and 10 (red). We can complete the coloring by choosing either green or blue. Both choices will give the same coloring, up to symmetry. This works, as you can check.. Assign a color C1 to the outer ring. It's a promising candidate because of the symmetry and topology of the figure. 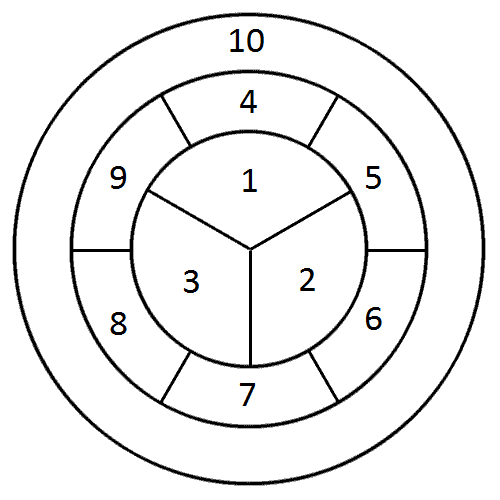 Therefore choose two more colors C2 and C3, and assign C1, C2, and C3 as the colors of the regions of the inner disk. 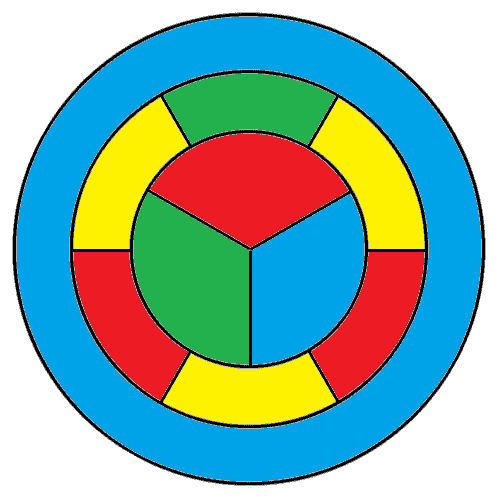 It doesn't matter which color is assigned to which region, as all arrangements are interconvertible by symmetry operations on the figure, as partially colored in step (1). Observe that there is exactly one segment of the middle ring that borders both C2 and C3 from the inner disk; it also, perforce, borders C1 from the outer ring. That segment requires a fourth color, C4. 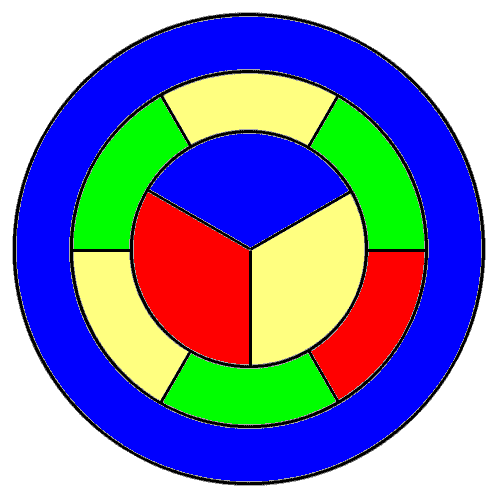 The color assignments made to this point leave only one choice each (without using a fifth color) for the remaining middle-ring segments other than the one opposite the region assigned in the previous step. Having made those assignments, two alternatives remain for the final region; either can be assigned. 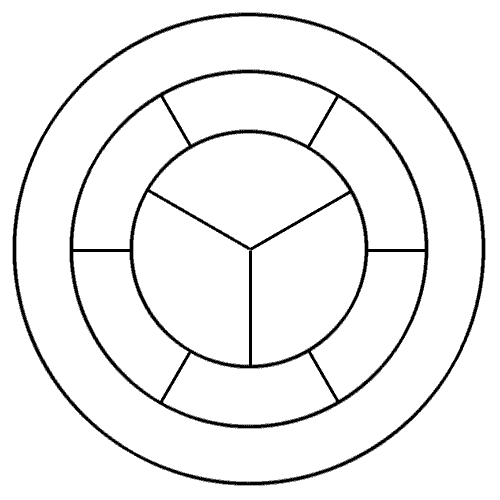 One possible 4-coloring of such. To answer the "algorithmically" question, this map has some regions that only border four others. There is a relatively short, algorithmic proof that if you can 4-colour all but one of the regions of a map, and the last region, R, only borders four others (call them R_1, R_2, R_3, R_4 in clockwise ordering about R), then you can colour the whole map. To do this, work as follows. It is easy unless R_1 to R_4 already use all the colours. Say they are blue, green, red, yellow in that order around region R. Now we try to recolour R_1 to red, in the hope that this will allow us to colour R blue. If we do that, we have to recolour any red region which borders R_1 blue. Then we have to recolour any blue region which borders one of these red, and so on. We keep doing this until we run out of things to recolour. Now one of two things happens: either we can colour R blue or we had to recolour R_3 blue. In the latter case, there was a chain of red and blue regions stretching from R_1 to R_3, but there can't also be a chain of green and yellow regions stretching from R_2 to R_4 (they have to cross somewhere, but the fact that they use different colours means that they can't). So now if we try the same trick recolouring R_2 yellow, any yellow regions next to R_2 green, and so on, this time we won't have to recolour R_4, and we will be able to colour R green. We've now shown that if we can colour everything apart from a region that meets four (or fewer) others, we can do this recolouring trick and then colour the last region. Similarly, if we had a colouring of some of the regions, and one of the uncoloured regions only bordered four coloured ones, we can recolour in this way and then colour that region as well. So if we can find an ordering of regions such that each one borders at most four previous ones, we can progressively recolour in this way. In this map we can -- basically progressively remove regions that only have four neighbours in what's left, then reverse that ordering -- so this algorithm will work. This method was the basis of Kempe's incorrect proof of the 4-colour theorem, and was used by Heawood to prove the 5-colour theorem (using five colours we are ok so long as there is always a region we can remove which borders at most five others, but that is true for any plane map). It can be used to easily find a 4-colouring of Martin Gardner's "April Fools" map, which would be very difficult to find by trial and error. Not the answer you're looking for? Browse other questions tagged graph-theory coloring planar-graph or ask your own question. Automatic solver of four-color theorem? What is a “map” in the four color theorem? How to color a map, so that one color covers the maximum area.